I guess you have to be a dyed-in-the-wool New Yorker to experience a little depression on September 10th. 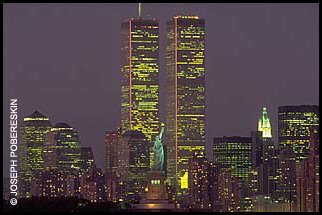 Tomorrow, September 11th, even five years after the terrorist attacks on NYC, will be extremely depressing for me. Generally speaking, I don't hold grudges. If I get angry about something I get over it quickly and put it behind me. As for September 11, 2001: I'm still angry .....and I won't forget! Inside job? Are you sure you know what you're talking about? Care to elaborate for a simpleton like me?